The Subaru BRZ is such a great driver’s car, it might make you cringe when I tell you that Mississippi State University turned one into a plug-in hybrid. What won’t make you cringe, though, are the performance figures. 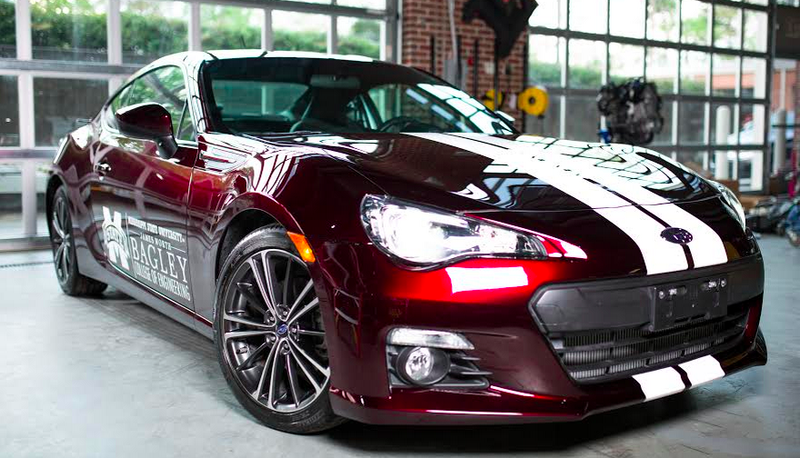 Mississippi State University revealed their hybrid BRZ on a grand stage last week at the Society of Automotive Engineers World Congress event in Detroit. What they showed all the enginerds at the show was that you can build a high fuel-efficiency car without necessarily sacrificing driving enjoyment. The BRZ plug-in hybrid, which has been in the making for over two years at MSU’s Center of Advanced Vehicular Systems, is a series hybrid much like the Chevrolet Volt, and incorporates a 850cc two-cylinder snowmobile engine along with dual electric motors. The little twin, which sits at the front of the vehicle, acts as a range extender for the two rear-mounted electric motors. Taking the space where the transmission used to sit is an approximately 13 kWh lithium-ion battery pack from 123 Systems that allows the little BRZ to drive 50 miles in fully-electric mode. I spoke with Matthew Doude, the “Car of the Future” project leader, and he told me the team of students initially stripped the BRZ down to the bare chassis so they could scan it into a computer-aided design software. They then packaged their components via CAD before installing parts in the car—just like the OEMs do it. The two motors, one for each wheel, sit in the back below the car, and required the students to design a completely new cast magnesium rear subframe, leaving the trailing arms as the only remaining stock suspension components. Each motor gets its own gear reduction, and that’s it as far as gearboxes go—no transmission, no rear differential, nothing. But that makes for easy computerized torque vectoring, something that MSU’s team is very proud of. There’s not even a shifter, as a fancy little knob takes its place for park-reverse-drive duties. Power figures haven’t been released, but Doude says 0-60 numbers are close to 5.7 seconds, or about a second faster than a stock BRZ. “Man, those motors must be really powerful,” you must be thinking., but that not necessarily the case, as the vehicle only weighs 2,904 pounds, or 80 pounds over stock. Yes, a plug-in hybrid BRZ weighs less than 100 pounds more than the gas version—that’s remarkable, especially considering that MSU says the interior is almost entirely stock (i.e. it hasn’t been stripped down), and the trunk volume has not been encroached upon by the rear motors. The smaller engine and its lower cooling demands probably helped a lot in keeping down the weight, but still, those battery cells are no joke. Cooling the batteries is a low-temperature radiator mounted in the front, sending coolant to proprietary heat exchangers in the battery pack. To warm the cells up, an electric heater—the one normally used for the heater core—can route warm coolant via a bypass valve to the cells for optimal low-temperature performance. MSU says that, while they’re still validating fuel economy figures on dynamometers, fuel economy figures are expected to be close to 100 MPGe. That’s an impressive figure, especially considering the weight and acceleration times. I think it’s safe to say they’ve accomplished that goal.